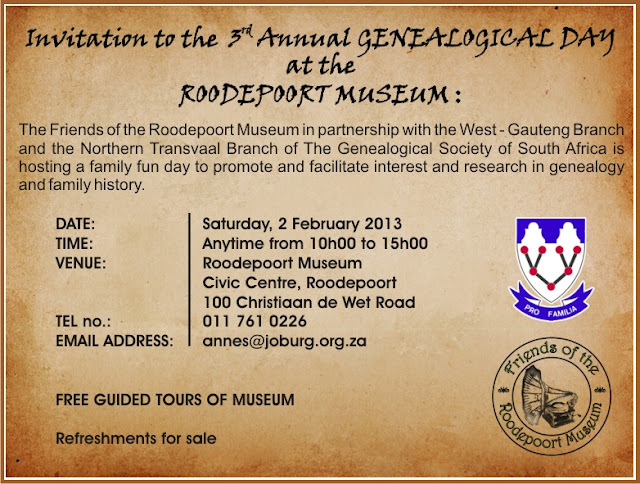 On Saturday, 2 February 2013 from 09:00 – 15:00 the Roodepoort Museum in partnership with the West - Gauteng Branch and the Northern Transvaal Branch of The Genealogical Society of South Africa is hosting a family fun day to promote and facilitate interest and research in genealogy and family history. Exhibitors will be available to guide you with your family history research and a series of talks covering various topics relating to genealogy will be hosted in the Promusica Theatre. See the programme below for more details. You may not be a descendant from a well known family but that does not mean you do not have an interesting family history. Your ancestors have survived plague, war, famine, illness, migration, political unrest, economic recession and dozens of other traumas. All this makes for interesting and exciting history and if you get to know something about your ancestors, you also gain knowledge about yourself.. Even more so if your surname is Barkhuizen, Human or Fourie, as the Barkhuizen, Human and Fourie Family Bonds will be among the exhibitors. Roodepoort Museum is situated in the Civic Centre, 100 Christiaan de Wet Road, Florida Park. (Entrance to the museum is right next to the Joburg ProMusica Theatre). Contact Tel. No. 011/761-0226 for more information. Ons praat Afrikaans en Engels. • 10h30 Genealogy for Dummies (Dommies) by Bob Saunders, chairman of the West-Gauteng branch of the Genealogical Society of South Africa. Bob will be giving an introduction to genealogy, where to start and where to find information. • 11h00 “LEAVE A LEGACY BEHIND- Record your family history” deur Isabel Groesbeek. Isabel, a professionele genealogiese navorser, sal verskillende maniere bespreek om die familie se geskiedenis te bewaar en ook die belangrikheid uitlig van mondelinge vertellings om sodoende interessante stories vir die nageslag te bewaar. • 12h00 Careers in Museums by Carolina Geldenhuys. Carolina, will be giving an insightful talk on the career opportunities, academic requirements and study fields available in the world of museums. The GSSA was founded in 1964 as a national non-profit organisation of people engaged in the study of genealogy, family trees and family history. It is funded by members who pay an annual membership subscription, and through the sale of products (some of which will also be on sale on this day). The WEST GAUTENG BRANCH of the GSSA was founded in 2001 to serve the area between Johannesburg and Krugersdorp and surroundings. Lucas Rinken, past chairperson of the West-Gauteng branch of the GSSA, will be available to assist you and has a personal database of about 650 000 will also be accessible to the public. • NOORD TRANSVAALTAK van die Genealogiese Genootskap van Suid-Afrika. Die tak is gedurende 1966 gestig. Die administrasie word vanuit Pretoria bestuur en die grense van die tak is wyd en strek oos, wes, noord en suid van Pretoria. Die tak bied ook oop dae en opleiding sessies aan om genealogie aan nuwe en potensiële lede bekend te stel. • Isabel Groesbeek, honoury member of the GSSA, has 25 years experience in genealogical research and regularly presents workshops on genealogy. Isabel will be presenting a talk at 11:00 and be available to offer assistance to all who wish to research their ancestors till 15:00. • Archival Quality Stationary and Storage: Genuine archival quality stationary is not commercially easily available. Stanwood CC has been the sole supplier of Archival Preservation Products to the Roodepoort Museum since the 1970s and will have some archival quality photo and document storage boxes, folders and markers for sale. If you want to come on another day, you need to make an appointment to view the museum and an admission fee of R20 for adults and R10 for children is payable. Tours are tailored to your needs and interests and on average last about one hour. 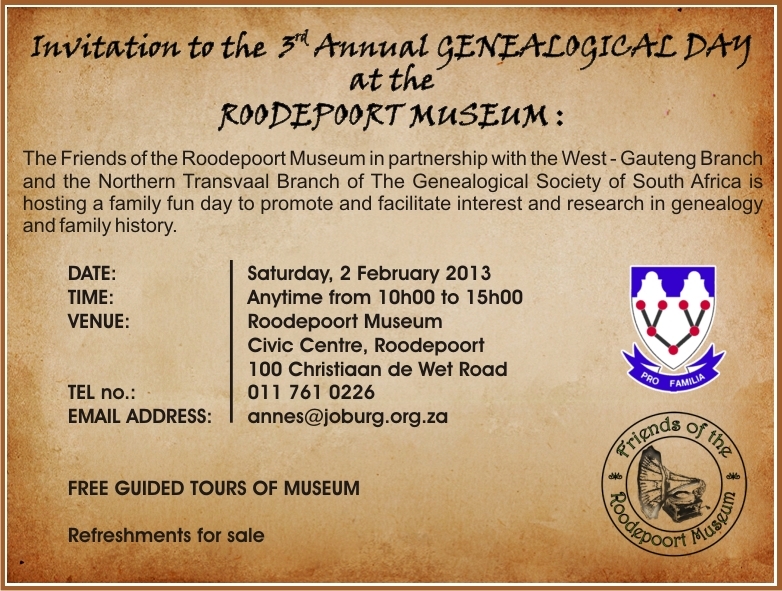 BUT on Saturday 2 February 2013 from 10:00-15:00 tours are for free and no appointment is needed.